No apologies this time — that is SO 2009 — but we’re about a week away from this year’s Academy Awards and waaaayyy behind in our reviews. In the pipeline are ‘Avatar,’ ‘Inglourious Basterds,’ ‘Up in the Air,’ and… ‘Harry Potter and the Half-Blood Prince,’ but first we’ve got some things to say about the best-yet movie about the Iraq War, ‘The Hurt Locker,’ Bombs away! At next Sunday’s Oscars, the fight for Best Picture and Director will come down to two movies — The Hurt Locker and Avatar — directed by two people who were once married. The former Mrs. James Cameron made a tense war movie brimming with authenticity; Mr. Kathryn Bigelow used 3-D cameras to tell a story about giant blue cats. The Academy of Motion Picture Arts and Sciences is all about inclusion this year in a BIG WAY. But if they’re separated by subject and budget (and by law), the two movies are united in their creative accomplishments: Avatar, for pushing the boundaries of film and galvanizing a relatively new technological movement; and The Hurt Locker, for finally “cracking” the Iraq War by telling a story whose focus isn’t squarely political. They are both winners in my book! But our concern today is the latter, a movie you MUST SEE before next Sunday (Avatar, of course, being in theaters until May) and one that will stay with you long after Mo’Nique has faded from public consciousness. 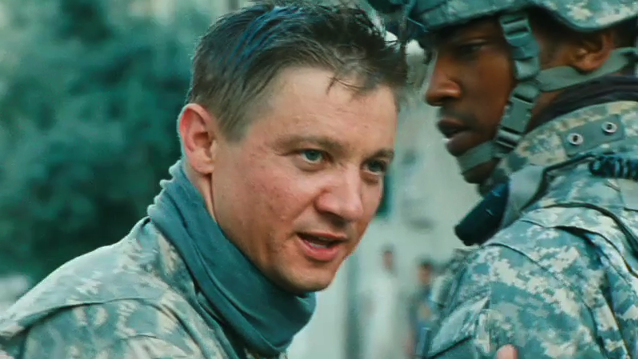 Jeremy Renner plays Staff Sergeant William James, a bomb-defusing renegade heading up Bravo Company’s EOD unit in Baghdad. He’s basically the Bomb Whisperer, a man who knows exactly what makes these devices tick (…) even when he’s not so good at communicating with his team. That would be the stoic Sanborn (Anthony Mackie) and naive Eldridge (Brian Geraghty), who don’t appreciate his unorthodox methods and wonder if they shouldn’t kill him before he gets them killed. Whether defusing a bomb sans bomb-defusing coveralls or turning off his walkie mid-operation, EOD’s team leader approaches their missions with a mixture of Zen-calm and Mel Gibson-in-Lethal Weapon suicidal gusto. James, it turns out, is sort of crazy. "You're a LOOSE CANNON, detec-- soldier!" Luckily, Locker doesn’t dwell on crazy James’ psychological rehabilitation or really bother to illuminate his past. He’s not a “mystery,” the way he would be in another movie, because Boal and Bigelow simply don’t care. He’s merely a guy who’s incredibly good at his job — often because of his apparent instability — and who, as we’re reminded with the film’s ticking clock motif, is just trying not to get killed. More than enough drama for me! Renner plays all of this without once diving into caricature, turning a character that on paper could have been something of a cliche into something real: a living, breathing soldier. Behind the camera, Bigelow and Co. create a world of almost documentary-like authenticity. Even in its more overtly stylized moments (none, thankfully, approaching Jarhead levels), this movie feels totally grounded. The bomb defusing scenes? They roll out in nearly real time, the camera catching every step-by-step move James and his team make as they work through the mission. It’s hardly boring, either, but tense and scary. We don’t know if James or any of them will make it out alive, and each wire cut is another “roll of the dice,” as Sanborn says — a very real chance of death. And these explosions look like they could REALLY KILL YOU. James drew literally the worst mascot assignment at Disney World. Of the other nine films nominated for Best Picture, Locker probably shares the most with Inglourious Basterds. Not on any narrative level — Hitler is only tortured here, not killed as he is in the latter — but definitely in the way Tarantino and Bigelow let their scenes unfold. Basterds has the one where Hans Landa eats dessert with the Jewish girl who escaped him years ago, or the scene where Aldo’s men find themselves trapped by an SS officer in a French bar. Both instant classics. Bigelow offers similar breathing room in Locker, whether in an embassy car-bomb defusing or a desert shootout. Even with Ralph Fiennes there to distract us, the scenes are staged with the hand of someone totally confident in her ability to rope us in. 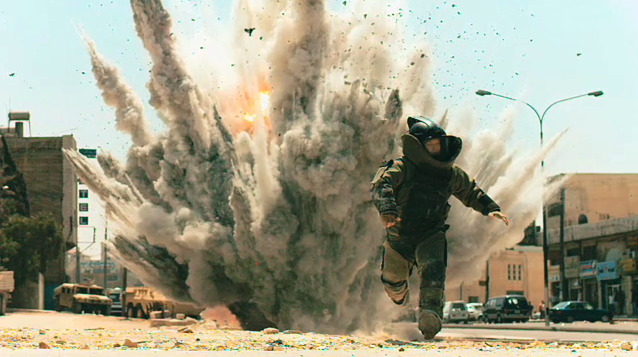 ALL THAT SAID, The Hurt Locker is first and foremost an action movie that serves in many ways as a response to the kind of war movies (whether about Iraq specifically, or just allegorically) that have emerged in the last decade. “Want to show how terrible and scary it is out there?” it almost asks. “Then offer the soldier’s perspective — get down to the level where this is someone’s JOB. Show what it’s like to do that job. Show how harrowing it is. And make no apologies.” This isn’t a movie about assigning blame, or painting a damning picture of an (undeniably dishonest and wrong) administration the way many previous cinematic stabs at Iraq have been. Nor is it totally apolitical; nothing is. But it’s the most honest picture of the year and, statues or not, a film you owe it to yourself to see. What are you waiting for? This entry was posted on February 25, 2010 at 4:04 pm and is filed under Reviews. You can follow any responses to this entry through the RSS 2.0 feed. You can leave a response, or trackback from your own site. have you seen “In The Loop”? In a review of that movie, you could pretty much plagiarize yourself and cut and past the above quote. It’s a great movie, and a great foil for Hurt Locker. PS-did you see the “wall street 2” trailer?!?! In the Loop should actually be arriving TOMORROW from Netflix, and I’m looking forward to comparing it with The Hurt Locker. Seeing what’s what. I did catch the Wall Street 2 trailer and, knowing your involvement in the movie’s production, am trying to keep my Shia-hating thoughts at bay. It looks entertaining! And topical! I’ve actually never seen the original, so it appears I have yet more homework to do in the coming weeks. Well, i have to admit, i think that the oscars is fun to look at, and i really think that hurt locker is a awesome movie to look at!